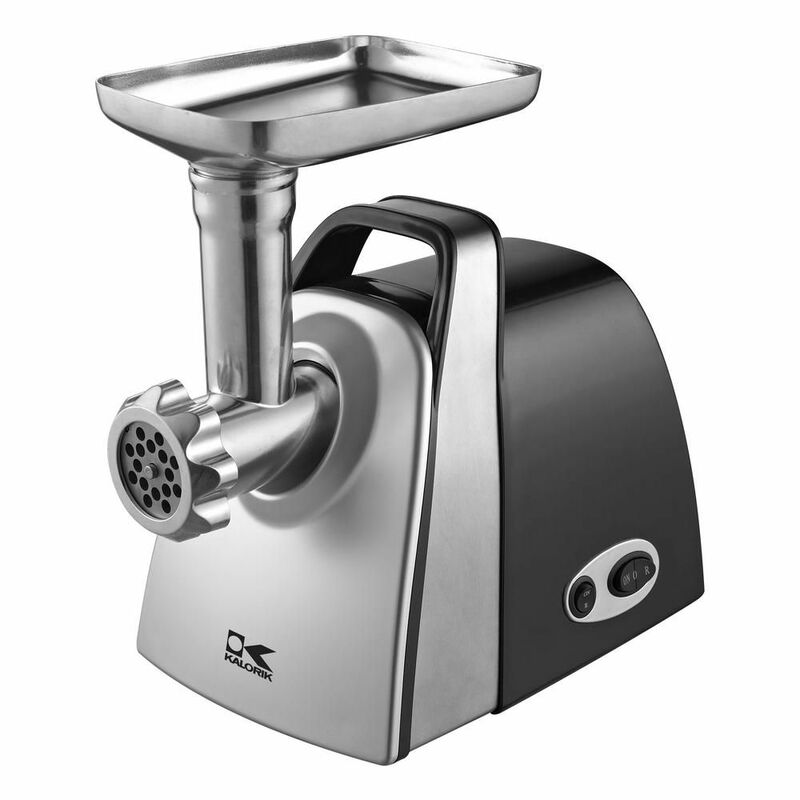 Kaloriks Meat Grinder features a powerful and durable motor that allows you to grind meat quickly, conveniently, and easily. Grind meat for burgers, chili, or tacos or make your own sausages! Its stainless steel blade and FDA-approved cutting disks allow for superior total meat output more than twice the output of most standard domestic models with 4 lbs per minute -, even when grinding small quantities. Its oblique dented gears produce maximum longevity and functionality and its user-resettable circuit breaker protects against overheating. The meat grinder has forward and reverse grinding options and comes with 2 sausage fillers (1 small and 1 large). Storage is also a breezethe attachments and cutting disks can be stored in the pusher and the unit features power cord storage. With a mountablebase for maximum stability, the GI 6 inch bench grinder restores edges, sharpens axes, hatchets, mower blades, smooth rough edges, level surfaces and keep your bits & chisels in top working order. The BG6001 features a motor durable enough for home or commercial applications. This 3450 RPM single speed grinder is ideal for use in your home workshop but is still powerful enough to be used in commercial applications. Our unique Twin LED work lights on adjustable flex shafts allows you to bend and flex for multiple viewing angles often required for fine, detailed work projects. Includes one medium and one coarse grinding wheel as well as two LARGE eye shields. With a mountable base for maximum stability, the GI 8 inch bench grinder restores edges, sharpens axes, hatchets, mower blades, smooth rough edges, level surfaces and keep your bits & chisels in top working order. The BG8002 features a motor durable enough for home or commercial applications. This 3550 RPM single speed grinder is ideal for use in your home workshop but is still powerful enough to be used in commercial applications. Our unique Twin LED work lights on adjustable flex shafts allows you to bend and flex for multiple viewing angles often required for fine, detailed work projects. Includes one medium and one coarse grinding wheel as well as two LARGE eye shields. Stop paying extra for pre-sliced food! Slice your own meat, cheese, bread, vegetables and fruit quickly and easily with this high-quality slicer. The variable thickness control makes it possible to choose from 0 (safe mode when unit is put away), deli-thin (1/32 inch) to thick (1/2 inch). The large multipurpose 7 1/2 inch serrated stainless steel blade handles a wide range of food sizes and shapes. Other highlights are the depth control and a strong, high-quality 200 watt gear motor. Electric Meat Grinder in Stainless Steel Kaloriks Meat Grinder features a powerful and durable motor that allows you to grind meat quickly, conveniently, and easily. Grind meat for burgers, chili, or tacos or make your own sausages! Its stainless steel blade and FDA-approved cutting disks allow for superior total meat output more than twice the output of most standard domestic models with 4 lbs per minute -, even when grinding small quantities. Its oblique dented gears produce maximum longevity and functionality and its user-resettable circuit breaker protects against overheating. The meat grinder has forward and reverse grinding options and comes with 2 sausage fillers (1 small and 1 large). Storage is also a breezethe attachments and cutting disks can be stored in the pusher and the unit features power cord storage. Electric Meat Grinder in Stainless Steel is rated 4.4 out of 5 by 12. Are the gears made of plastic or metal? are there any attachments to make pepperetes or sausages?